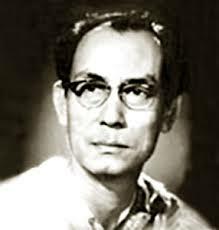 Today (October 31,2014) is the thirty-ninth death anniversary of one of Hindi film music’s greatest music composers, Sachin Dev Burman. SDB is one of my favourite music directors. O.P. Nayyar is another music director I have a special fondness for. As I sit to make a list of SDB songs, I realised that I have blogged about many of SDB songs already that are personal favourites – be it as a tribute to the lyricist or the actors or the director or the singer! 1) Tum Na Jaane Kis Jahan Mein Kho Gaye (Sazaa, 1951) : The SDB- Sahir combine was a team that collaborated for more than fifteen successful films in the short period of six years between 1951-1957. This brief partnership however resulted in some of the finest musical scores ever. 2) Jeene Do Jiyo (Taxi Driver, 1954): SDB won a Filmfare award for the despondent Talat Mahmood beauty, Jaayen toh Jaayen Kahan from this Navketan film starring Dev Anand and his then to-be-wife Kalpana Kartik. My favourite numbers from this movie are the three songs picturised on the club dancer (Sheila Ramani). It was a toss-up between Dil Jale to Jale and Ae Meri Zindagi Aaj Raat Jhoom Le (sung by Lata Mangeshkar) and Jeene Do Aur Jiyo. I picked Jeene Do Aur Jiyo – because it is the first song featuring my favourite artists (Asha -Sahir – SDB). The lyrics of both Ae Meri Zindagi and Jeene Do Aur Jiyo talk about the same thing – time is fleeting, what we have is now and today – so live and let live! Ae Meri Zindagi is contemplative while Jeene Do Aur Jiyo starts with Sheila Ramani stopping an altercation between Dev and another character. 3) Kya Ho Phir Jo Din Rangeela Ho (Nau Do Gyarah, 1957): This Navketan movie starring Dev Anand and Kalpana Kartik had fantastic music. The songs are popular even today – be it the lively Kishore solo, Hum Hain Rahi Pyar ke, the romantic Asha-Rafi duet, Aaja Pancchi Akela Hai or the naughty Asha-Kishore Aankhon Mein Kya Jee. My favourite song from this movie – and I remember it partly because of the way it has been filmed – is the not-so-well known Asha – Geeta dance number picturised on Helen and Shashikala. Helen is absolutely lovely and the entire number is well choreographed! Note the swirls of smoke (coordinated to the beat) from Shashikala’s cigar, when the song starts – beautiful! 4) O Nigahein Mastana (Paying Guest, 1957): This Filmistan movie starring Dev Anand and Nutan again was very popular for its music. The songs are remembered to this day – especially – the Kishore -Asha duet Chhod Do Aanchal (Is it my imagination or have there been more than one remix of this song in the last decade or so?) and the Kishore solo, Mana Janaab Ne Pukara Nahin. Lata Mangeshkar gets to sing two melodious numbers, the sad Chand Phir Nikla and the bubbly Chupke Chupke, Rukte Rukte. 5) Accha Ji Main Haari Chalo Maan Jao Na (Kala Pani, 1958) : This Navketan movie, directed by Raj Khosla won Dev Anand his first Filmfare award. Nalini Jaywant (who plays a dancer) won the best supporting actress. The heroine of the movie is an ethereal Madhubala. She plays a journalist who helps Dev Anand prove his father’s innocence. The music by SDB is fantastic – for example – the amazing Rafi solo, Hum bekhudi mein tumko or the Asha solo – Nazar Laagi Raja Tori Bangle Par. 6) Dil Ka Bhanwar Kare Pukar (Tere Ghar Ke Saamne, 1963) : Tere Ghar Ke Saamne is one of my favourite movies because of the light romantic story, fantastic performances by the entire cast – (especially Om Prakash and Harindranath Chattopadhyaya as the warring fathers) and the music. And it is entirely based in a city I consider home – so it is good to see how the familiar localities where I have grown up in, looked way back in the early sixties.How lovely Delhi looks in this movie! This song is a favourite as it is picturised in Qutub Minar – a monument I used to pass by daily once upon a time. Since the Qutub Minar has been shut for ages, I think the song has been shot in a set. 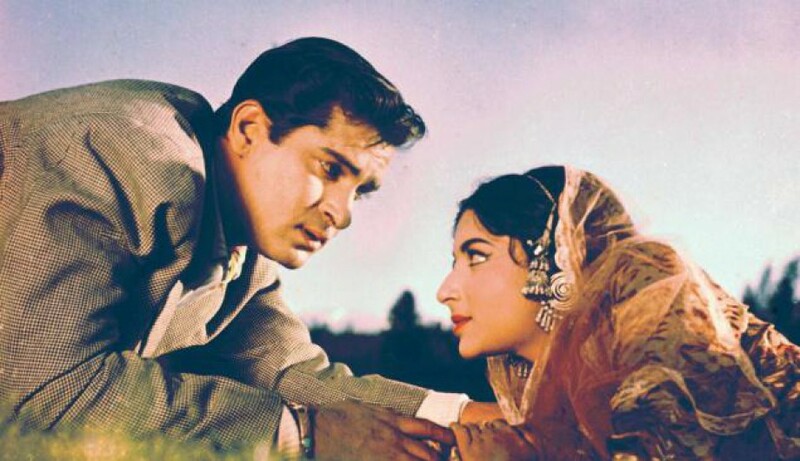 However, the scene before the song is shot in the gardens in front of the Qutub Minar – when Dev Anand accompanies Nutan’s family for a picnic..
Mohd Rafi sings this lovely ditty melodiously and Nutan is amazing. Can anyone believe that Dev Anand is 40 years old in this movie and Nutan has just come off a maternity break? And Vijay Anand again scores in his picturisation – Dev Anand spotting Nutan (in his drink) and singing to her in the title track Tere Ghar Ke Saamne is unforgettable! Nutan acted in another role in her comeback year – yes, as Kalyani in the Bimal Roy classic, Bandini. The music of that cinematic classic was also by Dada Burman. Utterly dissatisfied (there are so many more SDB songs that I love), I shall now sign off and probably post another list as a continuation shortly! This entry was posted in Uncategorized and tagged Dev Anand, Madhubala, Majrooh Sultanpuri, Mohd. Rafi, Navketan, S.D.Burman. Bookmark the permalink. Harini, I have long believed that I have a ‘long-lost siblings’ relationship with Anu Warrier (her blog is Conversations Over Chai) and Ira (Masala Punch). Now I’m convinced there’s something of the sort with you, too. I mean, if I were asked to make a list of my favourite SDB songs – barring Pyaasa and Kaala Bazaar – it would be uncannily similar to this one. Kya ho phir jo din rangeela ho, Acchha ji main haari, O nigaah-e-mastaana and Tum na jaane kis jahaan mein would certainly be there. All such lovely songs. (Tum na jaane kis jahaan mein, by the way, was a song my father introduced me to when I was very small – his older brother had played the guitar in it, so Papa is justifiably fond of the song. I love it too). You are in love with Sahir, Asha and Mohd Rafi! Will listen to the Madhubhala and Geeta Dutt starring songs! Darling Pri, I am very thankful that you read and comment on my blog. Just for your information – Geeta Dutt is a singer. 😉 Call me tonight for a 1-on-1 on old Hindi cinema. I have long believed that I have a ‘long-lost siblings’ relationship with Anu Warrier (her blog is Conversations Over Chai) and Ira (Masala Punch). Now I’m convinced there’s something of the sort with you, too. I mean, if I were asked to make a list of my favourite SDB songs – barring Pyaasa and Kaala Bazaar – it would be uncannily similar to this one. Kya ho phir jo din rangeela ho, Acchha ji main haari, O nigaah-e-mastaana and Tum na jaane kis jahaan mein would certainly be there. All such lovely songs. (Tum na jaane kis jahaan mein, by the way, was a song my father introduced me to when I was very small – his older brother had played the guitar in it, so Papa is justifiably fond of the song. I love it too). Aww, so sweet! Yes our tastes are uncannily similar… not just music but love for books and history – must be some connection! 🙂 I will check out Anu and Ira’s blog. Don’t think I have seen their blogs. Wow, is this the same uncle who played the starting notes of Taarif Karoon Kya Uski? No, the man who played in Taareef karoon was my father’s cousin, Sammy Daula – he was a fine musician, but only made fleeting visits to Bombay, playing as and when something happened to be available while he was in the city (he also played in Baar-baar dekho). My father’s elder brother, David Vernon Liddle – billed as Verni in the one film for which he composed music – played in Tum na jaane kis jahaan mein, Thandi hawaayein lehraake aayein, Aayega aanewaala and Mausam hai aashiqaana, among others.